The continuous presence of the guide was really annoying, so I started to think at a way to go on my own without him noticing. The chance came soon. When we got to know that our guide had organized a night at the theatre, together with a school mate we made a plan to escape. Eventually the opportunity we were waiting for had come! After a little while we discreetly left and rushed to explore the old city, the bars, the everyday life of the young people in Prague. We strolled in the Malà Strana, the Old Town, then stopped in a bar for a beer. We sat at a long wooden table with three young fellows, observing the place and trying to get a little taste of the local culture. We would have liked to talk with our table companions but didn’t know how to break the ice. Suddenly, my mate had a fantastic idea. He remembered having in his backpack some Swiss chocolate, took it out and offered it to the three young people. They accepted with pleasure and we started talking a bit. They were curious about us and we were about them. It was a long time ago and my memories are a little blurry. However, I can clearly remember a few things we had been talking about and which impressed me so much. ♦ Limited freedom: they could not travel outside the Communist European states (and even that was difficult) and they were not allowed to expatriate. The only possibility was trying to escape, an event requiring lots of money in foreign currency (that was one of the reasons, they explained, why illegal exchange was so widespread) and implying huge risks. ♦ Control: police was at every corner, ready to intervene – possibly also with violence – at the slightest suspect (no matter if totally arbitrary). People knew they were spied all the time and they had learned to live with fear. Overall, most people living in Czechoslovakia felt trapped and often hopeless. 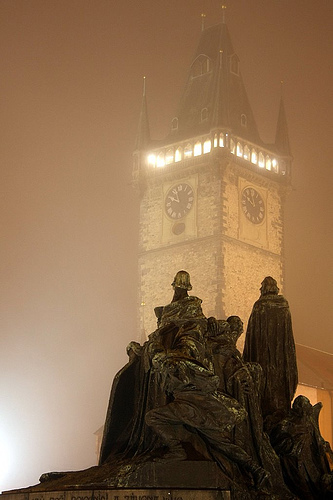 That’s why there was always a shade of sadness in their eyes and what gave Prague a sense of melancholy. Everything has changed and it’s hard to believe that there was a time, not so long ago, when the countries belonging to the ‘Eastern bloc‘ were a totally different world. That’s why I wanted to share my memories. We shall not forget the oppressions of the past. Hello fans of Prague 😉 Im from this nice city. 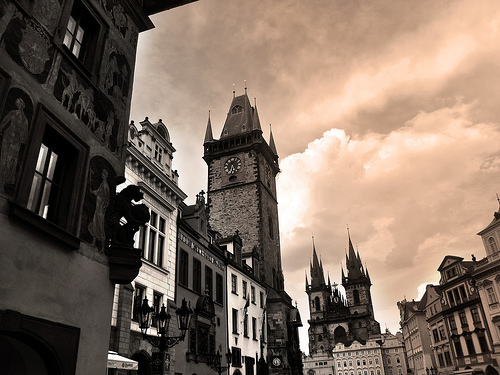 I am pleased that you was be charmed by Prague. I lived in Czechoslovakia at this time. And know that it was not so black as describing. Food was plentiful, only to have supply problems – outdated logistics.In modern built-up areas farther from the center was intense network of large stores. selection was not as in the West, but the basic foods were standard. Scarce goods was mainly electronics, quality clothing, western cars, various seasonings, etc. fear among the people was not. people are just resigned. if you had not openly against the regime, not have to worry. The Communists consistently combat only with dissent and differing individual. who did not protest, got an apartment, stay at a spa, a voucher for a car etc. I understand that it was a different world for you, and therefore the “romantic” rebuilding. But believe me, that people was everyday worries and joys. Looked forward to friends over a beer. How to take a girlfriend to the movies. Or it will go for a nice trip to the castle. Nevertheless, we are pleased that the Communists are gone. Disappeared the vile communist gray. We can speak freely, associate freely. We have a much better standard of living, a healthy economy. Things that we was envied the West, today we take for granted. Even Swiss chocolate. 😉 I am sending greetings from Prague, my friends. I’m so glad I found these posts about your trip to Prague in 1980! So interesting! 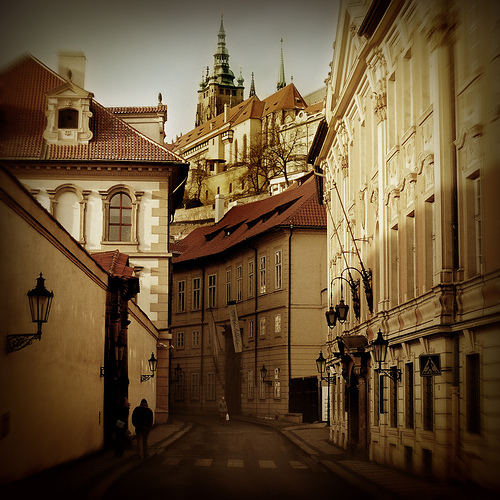 I lived in the Czech Republic 1996-1997, so I have a great love for the country and its beautiful capital city. I enjoyed reading about how it was to travel there during Communism. Of course, the Czech people always hated being oppressed, so I can imagine the city felt a bit melancholy, as you mentioned. I was last there in 2007, and even though a lot more people now speak English, I didn’t find the real essence of the city changed at all. It is still as beautiful as ever. What in interesting perspective on the people of Prague today and yesterday! And, your photos are quite stunning! Great article and post my friend!! How kind of you, Jeff. I’m glad you liked the story. I was willing to let people know how things looked at that time, helping them to see Prague also in a different perspective. Wow! What a great series and what an awesome opportunity you had to be able to experience a country before it had the chance to experience cultural freedoms. The pictures you chose fit your commentary perfectly. Have you been back to Prague since then? It’s high on my list of places to visit. I’m so glad you liked my Prague series. Although it makes me feel a bit old, it’s a piece of history. I went back to Prague a few years later, not long after the Berlin Wall was destroyed. Back then, people were starting to enjoy freedom again and what struck me was how thirsty they were about culture. Thank you so much for stopping by and commenting! Indeed, I did not take the photos featured on the post (back in 1980 I didn’t have a camera…) but chose them because I thought they’re gorgeous! I have really enjoyed this series, Simon. It’s a fascinating glimpse into Czechoslovakia during another time. I’m glad life has improved for them since then. The photos from all three parts of Remembering Prague are hauntingly beautiful, as is the writing. I never had the chance to visit any areas while they were part of the Eastern Block so hearing a first hand account is an important glimpse into the (not so distant) past that many of us would never know. Thank you so much for sharing your memories! Thank you Catia for you lovely comment. It’s good to read that you enjoyed both the photos (I’m amazed by how many awesome photographers I discovered on the internet) and the story. I hope you’ll come back and visit my blog to read more travel tales! Thank you, Marco. You’re always so kind. I’m so glad you enjoyed the Prague series!